Aside from needlework, I love collecting antiques and knick knack stuff, especially old knick knack junk. Now, the term “antiques” gets tossed about a lot, but in my mind I think most of what gets called “antiques” is just old junk. I have acquired some of both. In recent years, this modern, minimalist decorating trend has come into style, so I am still stuck in not exactly a “country style”, but an eclectic style, that I think of as “American clutter-bug “style. That’s me. My long-suffering husband likes Spartan living. I love to, over time, collect things, to create tablescape vignettes or arrangements for my walls. This all started when my grandmother gave my oldest sister a multi-volume set of interior-decorating books in the late 60s. My oldest sister is 8 years older than me, so she was a teenager, while I was probably around 8 or 9 years old. I poured over those interior decorating books and thus began this life-long love of decorating. 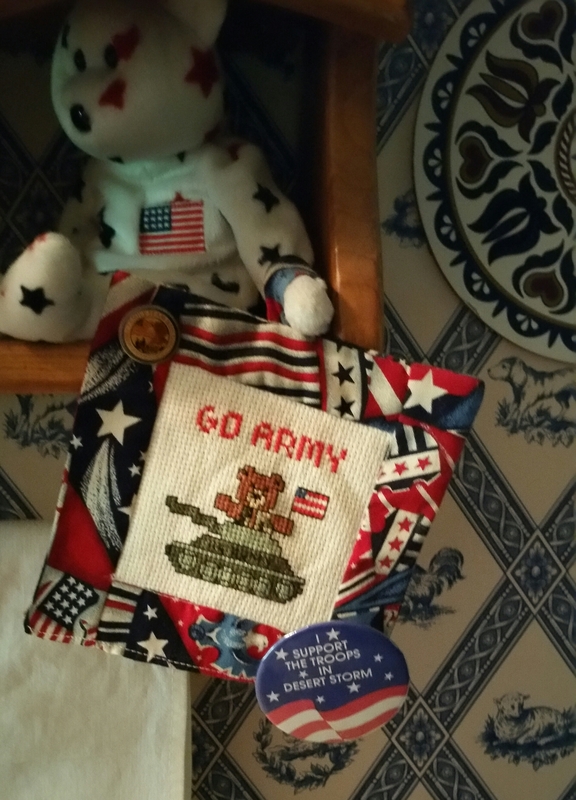 The above photo is a small counted cross stitch piece I made decades ago and it’s got an “I support the troops in Desert Storm” pin on the lower corner. Somehow, through no real design, I ended up with a lot of pins over the years too, lol. 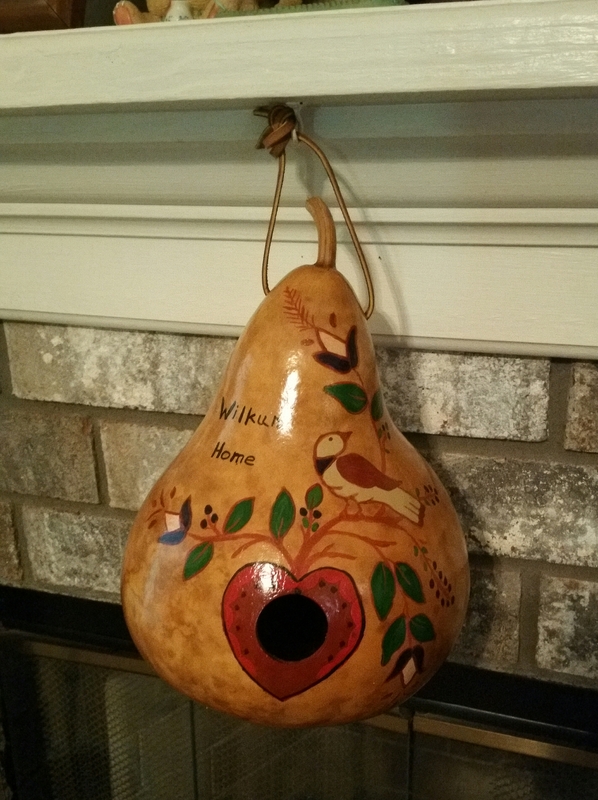 The other photo is actually a medicine cabinet I found at an antique/consignment shop, which I had my husband hang in the foyer. Anything requiring anchors is a call-in the guys job in my book, although I do know how to do it. I can see that tea towel needs to be washed and pressed again, sorry it’s awfully wrinkled. The God Bless America stitched piece one of my sons made in elementary school. I taught my sons, as well as my daughters, how to thread a needle and sew when they were young. Everyone should know how to sew a button back on, imo. 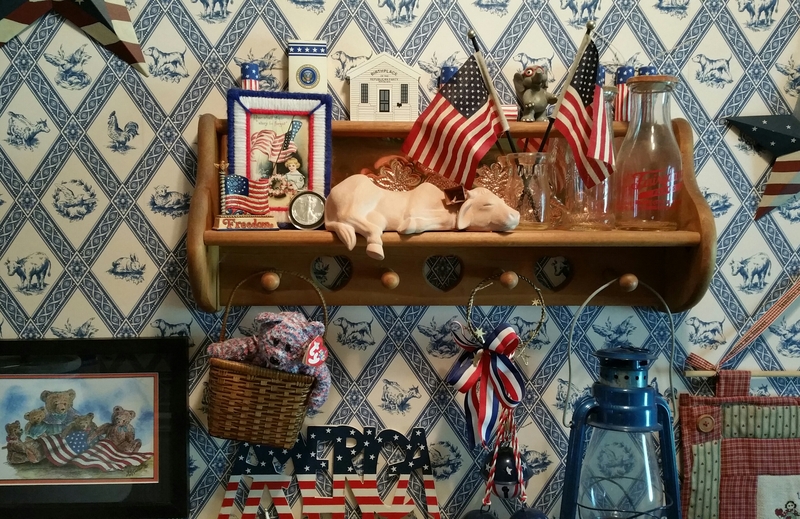 Along one wall in my foyer, I have a narrow table filled with American-themed stuff. On the left is a carnival glass, bicentennial Liberty Bell plate, which I really love. 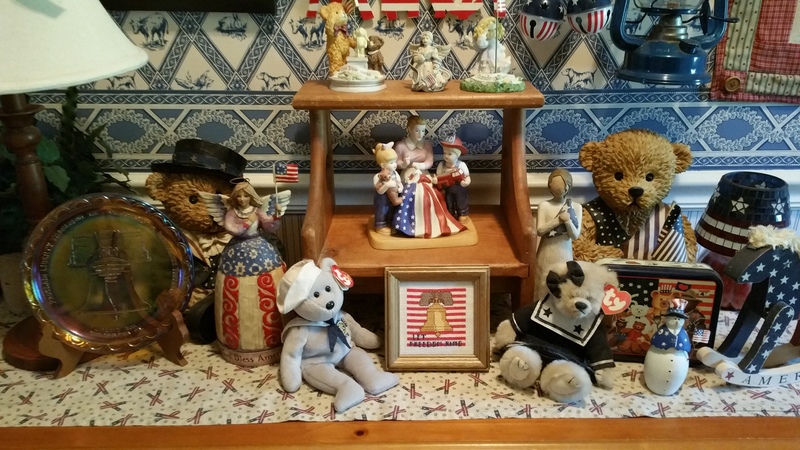 In the center, I took an old child’s stool (yard sale find) and used it as a display stand for some of my flag-themed figurines. At the bottom-center is a small counted cross-stitch piece I did last year. That gold frame was one of my typical repurposed projects. I had gone into my local Goodwill store, in search of an old book to tear apart for those paper wreaths I was working on. I had been looking for the “right” frame for this “Let Freedom Ring” piece, when I spotted a small, square, brown-framed mirror for $1.99. So, I looked at the back to see how it was put together and instantly thought, “I could use some gold leaf on that frame and it would be perfect!” So, when I got to the register the cashier told me that colored dot on it meant it was on sale for half-price. Wow, who knew that even the Goodwill does sales to move merchandise, lol. It only took a few minutes to take that mirror apart and apply the gold leaf. The rocking horse on the right is another yard sale find, 50 cents or a dollar, I think. I rarely pay more than a dollar for knick knack finds. The two larger teddy bear figurines in the back were a gift from my oldest daughter. The two beanie babies teddy bears in the front were from an old junk store. I sewed the table runner from clearance firecracker print fabric I found at Wal-mart. That’s it on that table, because it can’t hold anymore of my “junk”. 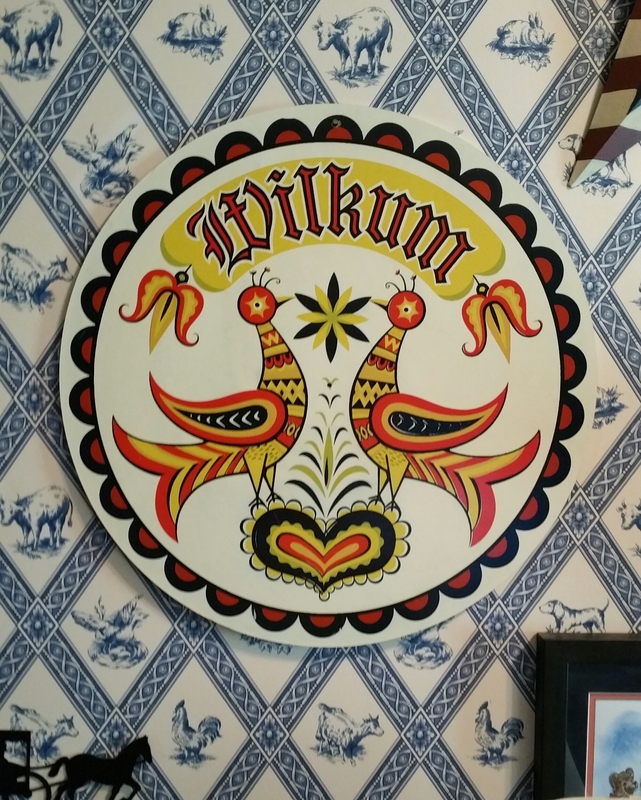 The other photo is of the wall above the table, with this country-style shelf. The framed vintage print is something I found online, printed out and glued onto poster board. Then I cut out a “frame” from plastic canvas and stitched the red, white and blue frame with yarn. I used craft glue to glue the “frame” to the print. The three antique milk bottles on the right, my father gave me long ago. As a kid, I started collecting old bottles. Often in the woods, near old farmsteads, you can find a lot of old bottles, from their old trash piles where farmers threw trash, before modern sanitation collection. I found several old trash piles walking around in the country where I grew up. I started carefully digging around and uncovering unbroken bottles. I have a lot of old brown glass Clorox bottles, among many others. Once I started coming home with these old bottles, my parents added to my collection with bottles from antique stores and flea markets. On the top of that shelf is a box of M&Ms from Air Force One and a little wooden figurine of the Birthplace of the Republican Party, which my youngest sister gave me. On the floor next to my table, I have a doll cradle (another yard sale find) filled with books and a yard-sale red, white and blue banner on the wall. Above left is a pin quilt, that a dear friend made for me, to stick some of these pins I end up having….. I don’t go buy them. The Reagan campaign pin one of my sons gave me. Near the bottom is a John Heinz pickle campaign pin, I love, that I acquired long, long ago when I was still a teenager and living in PA. I actually met John Heinz when I attended the Presidential Classroom for Young Americans as a senior in high school. While I love my Heinz pickle pin, I think I love my 1st Place ribbon at the bottom most. I won 1st place in a cookie-baking contest at the store where I worked years ago. Behind the 1st place ribbon is my 3rd place ribbon from our pie-baking contest. I made shoo-fly pie, but I lost to TWO sweet potato pies and I learned an important lesson in regional taste buds. Living in GA, I should have heeded that sage advice about “when in Rome”, but I didn’t and placed only 3rd…. On the right is a jigsaw puzzle I put together and glued together and mounted on foam core board. Jigsaw puzzles are another hobby of mine, but these days I stick to http://www.jigzone.com/. That site has tons of cuts to choose from. The “lizard cut” is one of my favorites for some reason, although I like the 184-piece crazy cut a lot too. I also started doing Mahjong Titans recently and that is the extent of my online gaming, lol. And, I’ll end with two photos below. I like “bunny stuff ” too. The simple blue and white design rabbits I stitched decades ago. To the right is a photo of the shelves on the bookcase hutch above my computer here. The “Somebunny loves you” cross-stitch I sewed decades ago too. The octagon-shaped Oriental design plate is another $1 yard sale find. Well, JK, It’s been my experience that most men don’t want to discuss teddy bears, bunnies and needlework;-) Of course, stating the obvious….. that men and women are very different, isn’t PC. I have met a few men who do counted-cross stitch and quilt btw., but they are few and far between, lol. My sons find pressing things they need to do if I start a conversation with, “Hey, look at what I found. Isn’t this just so cute?”…. Although, one of my sons will talk recipes with me, because he likes to cook. I guess the measuring and stuff makes it like a science experiment and appeals to his scientific mind….